I know that many of you travel here to the beach by car and it can be a long drive for you. Once you get here, you probably don't feel like going to the grocery store. I'm thinking you want to go directly to your beach house and get situated so you can relax and start enjoying some fun times. This is where Beach Butlers can help make your life a little easier. They can do your grocery shopping , have it all delivered and set up for you upon your arrival. Now that's the way to start your vacation here at the beach! My friends, Kirt and Trish Galiano, recently took over the ownership of Beach Butlers and I am very excited about this new venture for them and for our visitors here on 30A! 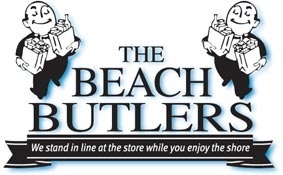 Beach Butlers services Hwy 30A, which includes Dune Allen Beach, Santa Rosa Beach, Blue Mountain Beach, Grayton Beach, WaterColor, Seaside, Seagrove Beach, WaterSound, Seacrest, Alys Beach, Rosemary Beach, Inlet Beach and Carillon Beach. They also provide grocery delivery to Panama City Beach, Sandestin and Destin.